Stir together the melted butter and thyme/oregano. Set aside. Place a large cast iron skillet (or other large oven-proof skillet, but we highly recommend cast iron as it yields the crispiest skin) on the lowest rack of your oven and then preheat the oven to 500 degrees. Allow the skillet to preheat with the oven. Rinse chicken, and pat dry with paper towels. Place the chicken breast side down on a cutting board and using sharp kitchen shears or a knife, but along both sides of the backbone to remove it. You can also just ask the butcher to do this for you! Flip the chicken over and press firmly down on breastbone to flatten the chicken. Once again, pat the chicken dry (this is vital!) with paper towels, then rub it all over with 2 tablespoons of olive oil and season both sides with salt and pepper. Once the oven has reached 500 degrees, remove the skillet from the oven with oven mitts, and place the chicken breast side down in the hot skillet. Reduce the oven temperature to 450 degrees and roast the chicken for 30-35 minutes, until the skin looks nice and brown. Remove skillet from the oven. Carefully remove the chicken, breast side up, to a carving board. Add the wine and lemon juice to the skillet and using a wooden spoon, scrape up all the yummy brown bits. Place the chicken back in the skillet, breast side up, and brush the herb butter all over. Return to oven and reduce temperature to 400. 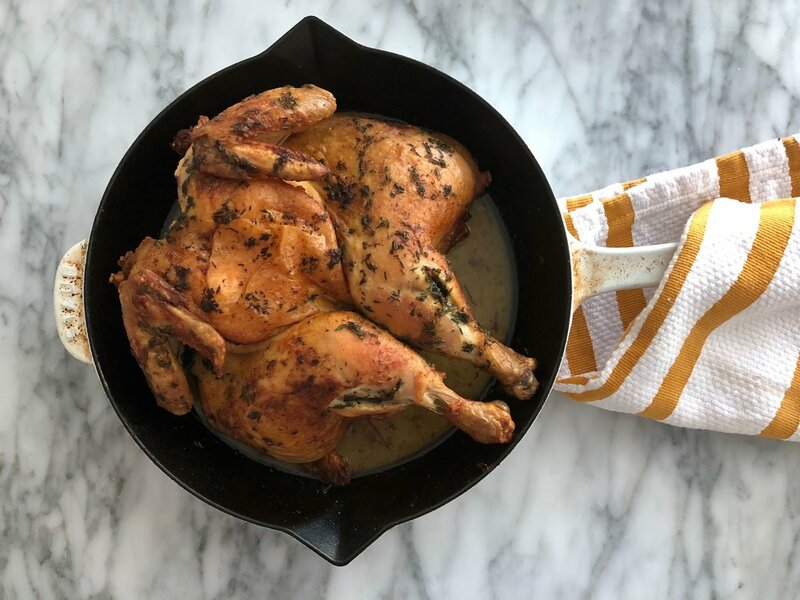 Roast chicken for about 10 minutes, or until an instant-read thermometer or oven probe registers at least 165 degrees in the thickest part of a thigh. Transfer chicken to a carving plate or board and let rest about 10 minutes before you slice. Serve with pan juices!